Doyle McManus' week-end column confirmed what I thought all along. Political conventions are held only to pump up the party faithful for the coming election. Both campaigns can't be right, of course. But their mutual conviction that they have the advantage meant that neither side felt it had to move toward the middle. Instead, with both parties focused more on mobilization than persuasion, the conventions were aimed mostly at rousing the faithful. While the economy was mentioned in each convention, little of any substance was said in either venue. And there was little mention of compromise, of reaching across the aisle to get things back on track and done. 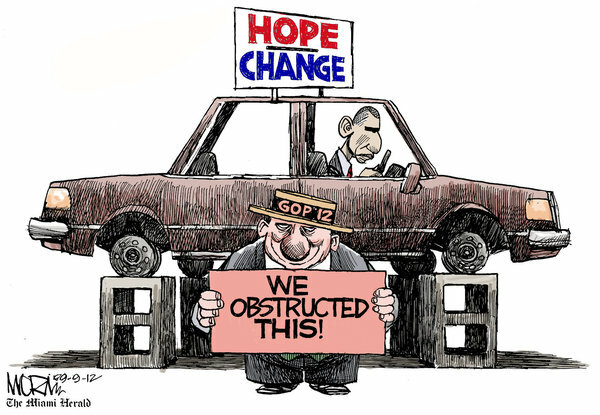 Of course, that would have been a lost cause in any event, at least for the Democrats, given the last 3+ years (see Morin's cartoon). Still, what we got over the last two weeks were unending pictures and sound bites of a divided nation. Neither Romney nor Obama managed to use the conventions to open a commanding lead. That doesn't mean that their time was wasted. But it does mean that this campaign is likely to remain close, divisive and joyless. It's going to be a long 59 days. Maybe the candidate's time wasn't wasted, but I sure felt like I was robbed. And I'm getting pretty damned sick of popcorn.